Warning: This blog post contains images and descriptions that might not be suitable for vegetarians, closed-minded or fragile readers. Some may find the content disturbing. If you do read, please have an open mind and the ability to understand a different culture. Thank you. Every year, on the 10th day of the Islamic calendar’s last month, falls one of the two Muslim feast holiday: Eid Al-Adha. This Festival of Sacrifice is to honour the willingness of the prophet Abraham to sacrifice his son as an act of compliance to command. When the son accepted and the sacrifice was about to be performed, Allah stopped to provide Abraham with a lamb to kill instead. Muslim families from all around the world will sacrifice a sheep or a goat every year on that special religious holiday. Today, on October 16th, 2013, I witnessed with my own eyes such an intimate and important religious ceremony. My host family have been preparing for the feast all weekend. They made and baked the mkhamer (bread), dried and chopped the herbs, prepared side dishes of backoula (spinach salad), zarlouk (cooked eggplants) and khizou mchermel (spiced carrots). They sharpened the knife. They got the sheep. Sheep pushed in carts have been circulating all over town the past few days. Each Muslim family purchased a sheep or a goat and kept them on their outdoor terrace or home for a few days prior the sacrifice. 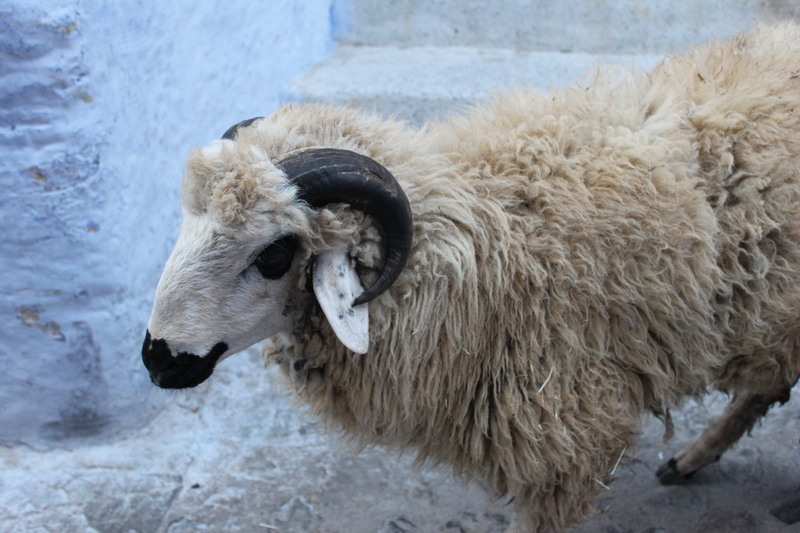 The bleating of sheep was added to the sounds of prayer chanting at night. Earlier this morning we went to the grandmother’s home where all the rest of the family reunited. Aunts, uncles, cousins, everybody was present as well as 2 students from Senegal. There were also 3 sheep, one for each small family. Being part of the sacrifice was never planned. I didn’t research well prior my arrival and was unaware of this important holiday. When it was mentioned and described to me, I was put into a strange blend of anxiety and excitement. I’ve never witness death before, therefore this unique opportunity had to be taken with arms wide open. I am not a vegetarian back home, but I always prefer vegetables and fish over meat, by taste preference at first, and also because I don’t know where my meat comes from. It is not for health reasons, but rather for animal cruelty concern. I don’t agree with our meat industry and wished people would realize how much abuse is made towards animals. Being part of the sacrifice was going to be hard, but also a massive eye-opening experience. Salt was thrown over the drain in the outdoor terrace. The first sheep was brought out. 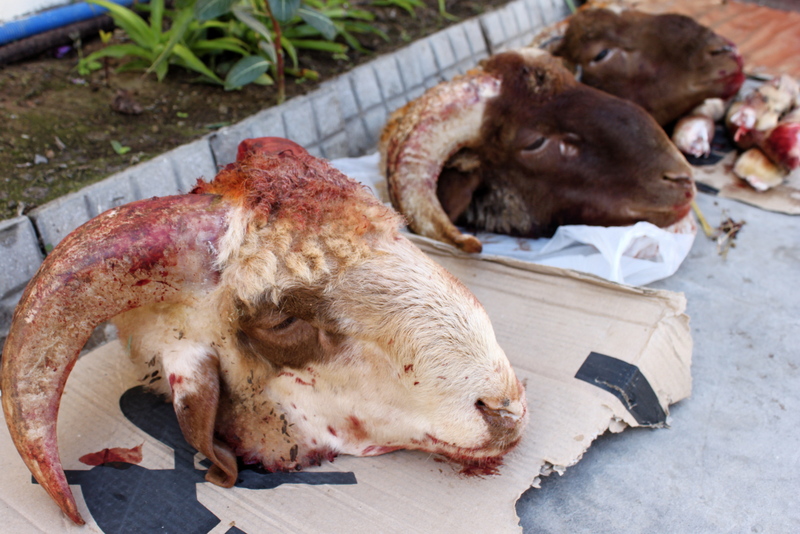 The butcher, after doing his prayer, put the ram on its side and caressed his back. With a sharp movement, he cut the throat. The blood sprayed out its vein. It died immediately. However, its legs shook as the blood tried to rush to the brain, and back and forth. Agony. I found myself in the mix of emotions and placed my sunglasses to hide the tears accumulating at the edge of my eyes. The blood squirting was overwhelming. The scene was perturbing. The death of a living was heart aching. But I held on. I was so fortunate to be there. The butcher chopped the head off. And then came the hoofs. He sliced the bottom of one leg and blew air into the skin. The inert animal blew up like a balloon, making it easier to lacerate the skin from the muscle. When completely removed, the skin and wool is kept aside to later be cleaned and used as praying mats. The animal was then hoisted by the back legs. It was time for the belly to be carved. He removed the organs and placed them into a plastic basin. They were put aside for today’s BBQ and dinner. A cousin grabbed my hand and hurried me inside the house. The Royal ceremony just started and was displayed on TV. The King performed a Sunnah prayer followed by a sermon. It was to Mohammed V, the King, to sacrifice the first sheep (the one for his palace). Then the butcher did the second one (for the country). Celebrations at the palace followed the sacrifice. The smell of the charcoal burning under the grill dragged us outside. I helped the younger ladies wrap the belly fat around pieces of liver and stab them on sticks to make kotbane (shishkabobs). The women marinated the lungs and the rest of the liver for the dinner later. 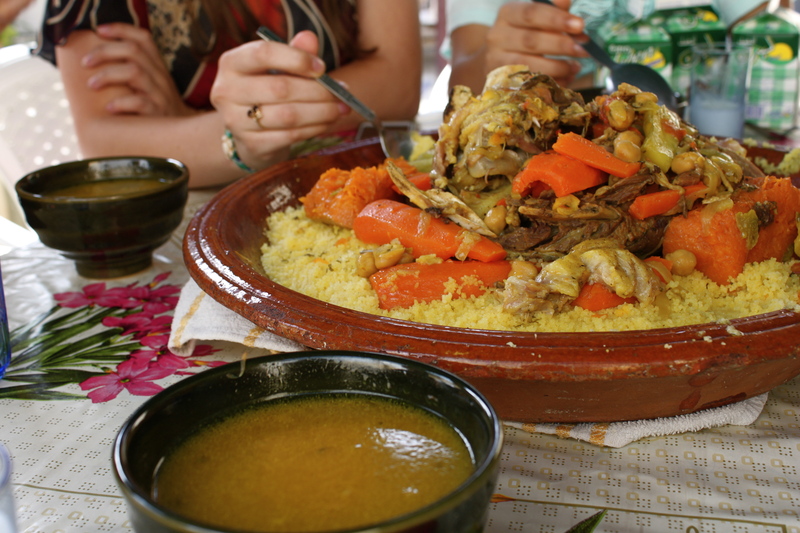 As a tradition, the organs are eaten on the day of the sacrifice, the meat in tagines the next day and the head on the Friday’s couscous. 1/3 of the meat is kept for the family, another 1/3 to trade to neighbours and family and the rest goes to the poor and needy. From head to hoofs, nose to tail, everything is eaten. The table was set outside with Moroccan blankets wrapped on its side to diminish the heat of the midday sun. Everybody grabbed a dish and placed it in the center of the table. We gathered for the feast. We laughed, smiled, spoke a mix of Arabic, French and English. A multi-ethnic lunch with various conversation from history to religion to simple joy talks. We spent the afternoon dancing on the rhythms of Arabic music. From the younger son to the grand-mother, everybody showed their moves on the living room floor. There was no time to sleep or be tired. It was time to celebrate. More than 25 billion animals are killed by the meat industry each year. As soon as they are born, they are put in overcrowded cages, crates or stalls. They are deprived from exercise, sunlight and care. 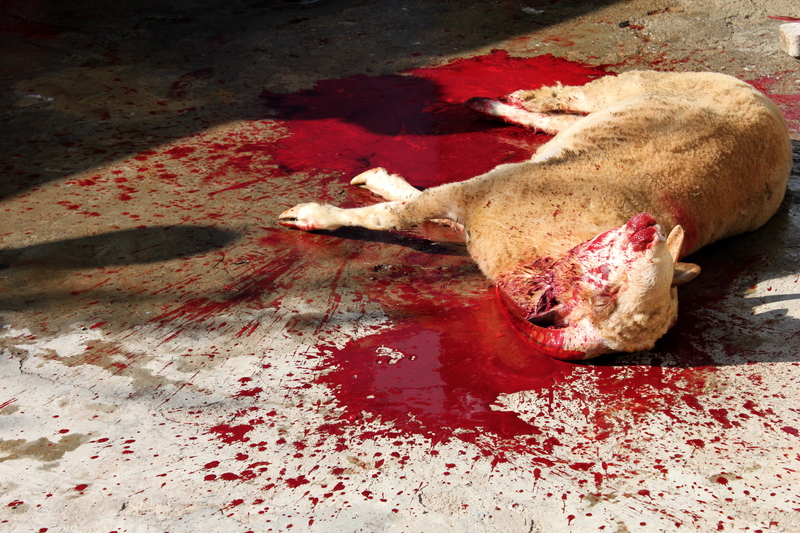 The average American meat-eater is responsible for the death of about 90 abused animal per year. Today I witnessed the raw death of 3 animals. However, these creatures had the best life a sheep could have. They were found in the mountains after living a life of running wild and free. They were brought to a home where they were given respect and care. They were killed quickly and efficiently. Yes, it was hard to see. But I’m glad I did. This unique experience was given to me as an opportunity to open my eyes not only on another religion and culture, but also on mine. Belle maturité d’une jeune femme. Tu peux prendre tes distances et ne pas te laisser envahir par des émotions qui amènent au jugement. J’aime que tu fasses le lien avec les Américains. Combien de dindes ont été abattues pour notre Action de grâces, et quand on sait comment elles sont élevées, traitées et tuées, on n’a pas à faire de leçon et la citation de Gandhi est très éloquente. Bises. This was written from the eyes of a visitor. I am glad you think I described it well, coming from an Arab Muslim. Thank you so much Aziz!